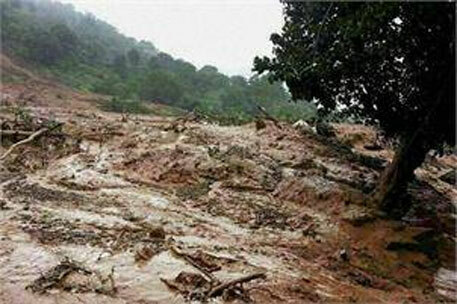 A massive landslide that brought down a hillock in Malin village in Ambegaon taluk of Pune distruct, claimed 25 lives on Wednesday while more than 160 were trapped under debris. The immediate reason for the landslide that occurred at about 5 am was incessant rainfall, as cited by police. The incident came to light at 7 am when a bus driver failed to find the village which was a regular stop on the route. But there is more to the landslide than what meets the eye. Malin is one of the 37 villages in Ambegaon taluk that was identified ecologically sensitive area by the Kasturirangan committee in its report on Western Ghats. It was only in December 2013, that orders were issued to implement Union environment ministry's notification that banned mining, quarrying, construction of thermal plants and big building complexes in such areas. The tehsildars were supposed to assess all the constructions as well as mining and quarrying activities in these villages. The Kasturirangan committee had recommended a ban on development activities in 60,000 sq km ecologically sensitive area spread over Gujarat, Karnataka, Maharashtra, Goa, Kerala and Tamil Nadu. In Maharstra, the notification was applicable in Ahmednagar, Dhule, Kolhapur, Nandurbar, Nashik, Pune, Raigad, Ratnagiri, Sangli, Sindhudurg, Satara and Thane. The panel also restricted buildings to less than 20,000 sq ft in 123 villages mentioned in the report. But lately, Ambegaon had become realty hot spot. Ambegaon taluk is in the Shirur subdivision of Pune district where there has been a significant rise in number of resorts and farm houses. Several real estate developers have been advertising these farm houses or boutique residencies as "lake villa" or "hill villa". The taluk also has several tribal villages and one of them is Malin. Bastu Rege, executive director of Pune-based non-profit Santulan, explained that the real estate boom also triggered increase in illegal stone quarries in Ambegaon taluk. There are more than 76 stone quarries in Ambegaon alone, he says. Building stones, gravel, ordinary clay, ordinary sand, limestone which is used for burning lime, boulders, pebbles, brick earth, bentonite, road metal, slate, marble are being mined indiscriminately weakening the hills. “About 70 per cent of these quarries are being run illegally because of the inaction of the revenue department. Apart from the usual minor minerals, semi precious stones are also mined from these hills,” says Rege. Several such mines were there in Malin village where the landslide took place. “This could be a probable reason why a mere 4 mm rainfall in the last 24 hours caused a hillock to crash,” says Rege. I am aware that this is "immediate reporting". However, I still expected more in depth analysis from DTE; this sounds like any other newspaper reporting - wihtout insights. I hope more on this topic in next couple of weeks. There are two Ambegaons. One near Pune, which the story above quotes, and one about 120 kms from Pune, near Bhimashanker where the tragedy happened. The Ambegaon quoted in the story above (realty boom, etc) has nothing to do with Ambegaon where this mishap happened. We expect DTE to check its facts before publishing such reports. I have written about Ambegaon Taluk which is fairly large. The real estate boom is near Ambegaon town in the Ambegaon tehsil which has several villages and one of them is Malin. I have written in the story that because of the real estate boom in Ambegaon, a lot of tribal hilly villages (some of them quite far from Ambegaon) are falling prey to indiscriminate mining. There are several stone quarries near Malin. When there is real estate development at someplace, the illegal resources usually come from areas that not too close to the project sites. This is done to evade scrutiny. Such illegal mining often uses tractors instead of heavy trucks. So, I spoke about the Ambegaon which is in Ambegaon Taluk. I hope this will end the confusion. I also happen to possess a list of (official and unofficial) quarries that are around Malin. Are you saying the list from mining directorate is wrong?